When I saw this trio of mini Peter Thomas Roth masks online, I was intrigued because I've never tried any of their products and the idea of a gel wash-off mask seemed appealing. For $20, you get half an ounce of three masks: the Cucumber Gel Mask, Rose Stem Cell Bio Repair Gel Mask and Pumpkin Enzyme Mask. Did I like any of these masks enough to warrant purchasing a full size? I'm always lured in by sample sizes as the jars are adorable, travel friendly and I can actually use up the product within a reasonable amount of time. Although the website clearly stated the size of these minis, I was pretty surprised at how small they were. If you compare the price of the full sizes, this mini trio is actually not a value set and it costs less per ounce to purchase a full sized jar of each mask. You essentially get $14.80 worth of product for $20 which is quite disappointing. The good news is that you don't need a lot of product per use so you can probably get at least six applications per half ounce tub. The Cucumber Gel Mask is supposed to be refreshing, cooling, moisturizing, and calming but frankly, I don't seem to notice a difference in my skin after using this. The gel is cooling at the onset of application but it doesn't stay that way and after rinsing off, my skin doesn't seem to be any more moisturized or calm. I will save this for the summer after a day at the beach and perhaps it will be good for as an aftersun mask. The Rose Stem Cell Mask has a slew of benefits for anti-aging, moisture and brightening. 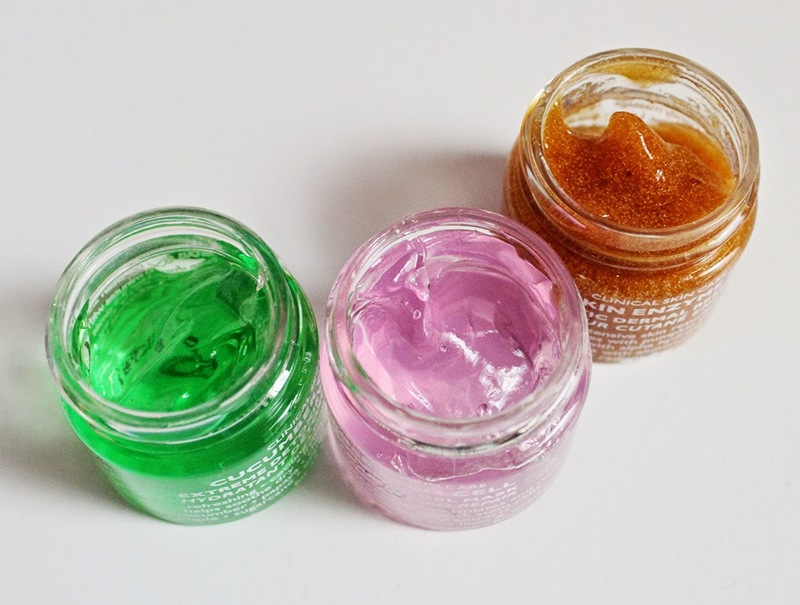 The texture of both this mask and the cucumber mask are a thick malleable jelly, almost like a hair gel. The rose mask actually stung a bit on my cheeks when I applied it to my skin. The mask has a pleasant rose scent that is not too overpowering. I hope it's not just my bias towards rose scented products but I think this mask makes my skin a touch softer after use. It's definitely not anything drastic but my skin looks a bit more smooth and healthy. The Pumpkin Enzyme Mask had the most noticeable effect but it's also very strong in terms of a chemical exfoliant and I would warn people with sensitive skin to patch test this before applying all over. The mask smells amazing and just like pumpkin pie which is nice if you like pumpkin pie and probably not so good if you don't. The directions say to massage the mask on your face as a scrub since there are bits of aluminum oxide that physically exfoliate. Then let the mask sit for three to five minutes to allow the pumpkin enzymes and alpha hydroxy acids to do their work. Unfortunately I couldn't even manually scrub and only let the mask sit on my face for about a minute before I had to wash it off. The mask practically felt like it was burning. After rinsing there was no noticeable damage to my skin and I'm happy to report that my face was much smoother after just a quick treatment. 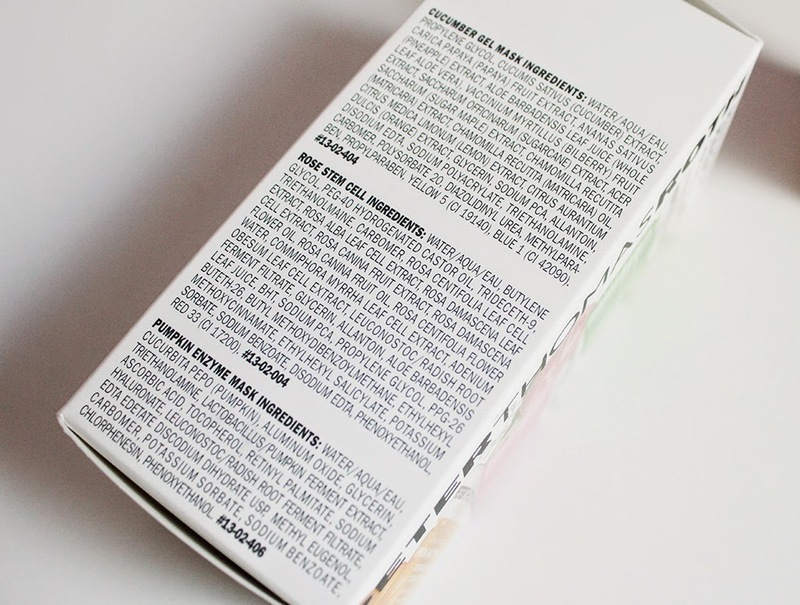 Above are the ingredients lists for all three masks which are conveniently labeled on the packaging. I'm disappointed to report the cucumber and rose masks weren't very effective and not worth the $45 for a full size. The pumpkin mask definitely did its job but it was a bit too strong for my skin so I won't be purchasing it either. Have you tried these masks? 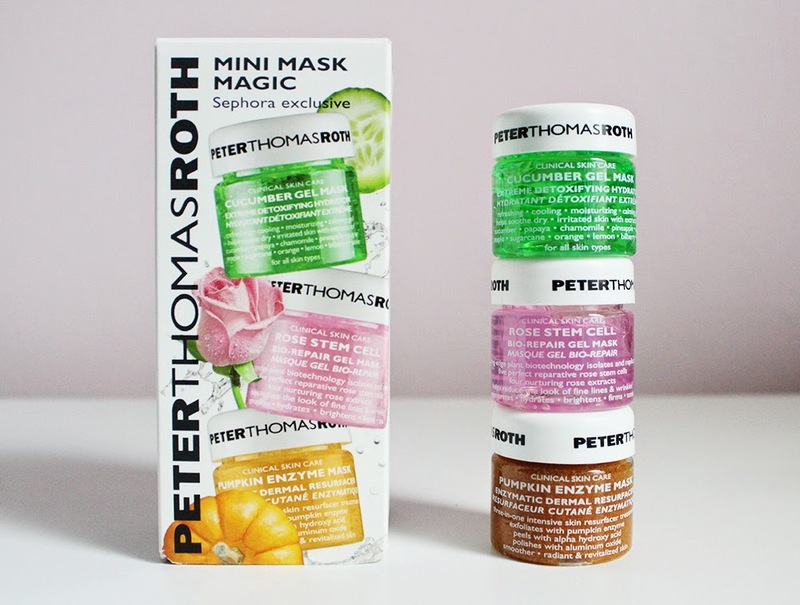 I'm curious to hear other reviews as the ratings on Sephora are quite high for these masks!